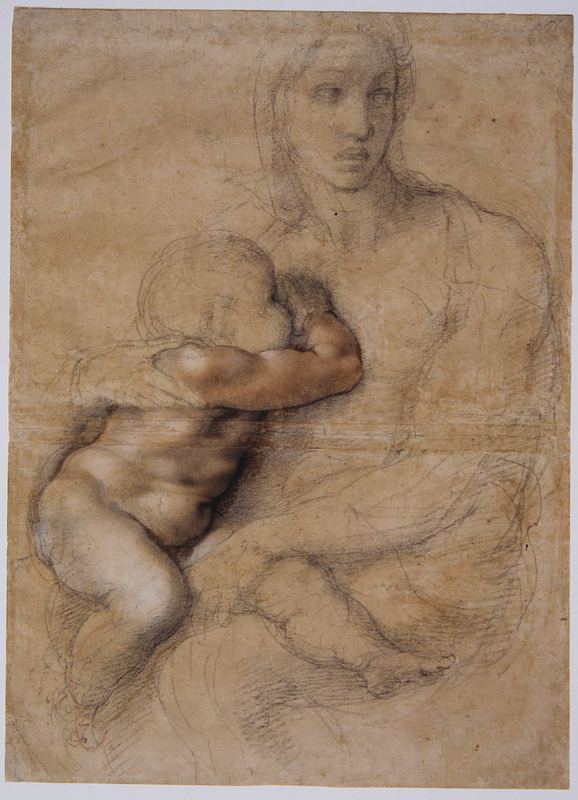 There are only about a dozen of Michelangelo’s drawings in the United States, so the US exhibit of 26 important drawings from the extensive collection of the Casa Buonarroti, the museum established by his family in a house he once owned in Florence, is a not-to-be-missed event. Michelangelo: Sacred and Profane Masterpiece Drawings from the Casa Buonarroti is an exhibit of figural and architectural drawings by Michelangelo on subjects both religious (sacred) and worldly (profane). It debuted in February at the College of William & Mary’s Muscarelle Museum of Art in honor of the museum’s 30th anniversary and has now moved to the Museum of Fine Arts in Boston where it will run from April 21st until June 30th. The theme is an exploration of Michelangelo’s personal philosophy, his attitude towards religious and secular matters, as reflected in his drawings. The sacred sphere is represented by his depictions of religious figures like his large scale Virgin and Child and in architectural designs for churches like the façade of San Lorenzo in Florence. 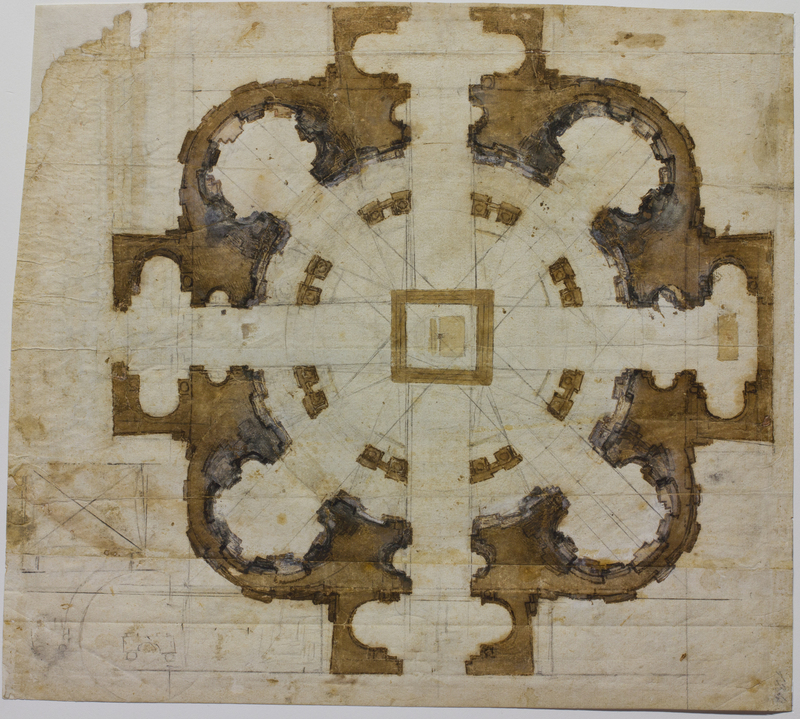 His ground plan of the church of San Giovanni dei Fiorentini in Rome, which was too complex and expensive to ever make it out of the planning stage, is one of the largest drawings in the collection and has never been seen before in the United States. The profane architectural pieces are mainly designs for military fortifications, but much like his sacred pieces, the plans are so elaborate they would have been far too expensive and difficult for the conception to become reality. The star of the profane figural drawings is Cleopatra. Although a worldly subject, on one page back and front, she incarnates both sides of the show’s theme. The recto or front depicts Cleopatra’s idealized calm in the moment when the serpent strikes her breast. It’s a Madonna-like expression of dignity and resignation. Her elegance and refinement have earned her distinction as one of Michelangelo’s most beautiful figures, but what’s on the back is not serene and not beautiful either, at least according to some beholders. 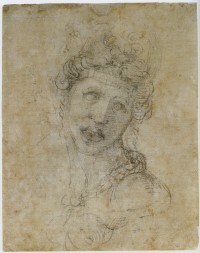 The verso is a drawing of the same Cleopatra, only this one’s expression is sheer agony. The details are nowhere near as refined: she’s a grotesque with empty, wonky eyes and buckteeth. How these contrasting ladies came to find themselves on the front and back of a page is a question that has long intrigued art historians. The Cleopatra on the recto is one of the rare complete, finished pieces Michelangelo drew. Most of his drawings were studies or sketches for projects that would later come to fruition in another medium. Art historian Johannes Wilde dubbed these finished pieces “presentation drawings,” because they were intended to be given as gifts. Rarely for a Michelangelo drawing, there’s a clearly documented ownership history for Cleopatra that confirms it was a gift from the master to a handsome young friend. Some time during the 1530s, Michelangelo gave Cleopatra to Tommaso de’ Cavalieri, a Roman nobleman who met Michelangelo in 1532 when the artist was 57 and Cavalieri 23 years old. They became fast friends and remained so until Michelangelo’s death 32 years later. The question of whether Michelangelo’s feelings for his beautiful friend were more than platonic is an open one, but he did dedicate more poems to Cavalieri than to anyone else (see this one for an example; the female pronouns in the translation are not present in the Italian) and gave him at least six completed drawings (The Fall of Phaethon is the most elaborate). In 1562, two years before Michelangelo’s death, Cavalieri was forced to give Cleopatra to Duke Cosimo I de’ Medici. He had little choice in the matter and made it known in his letter accompanying the “gift” that depriving himself of that drawing caused him as much pain as if he’d lost a son. 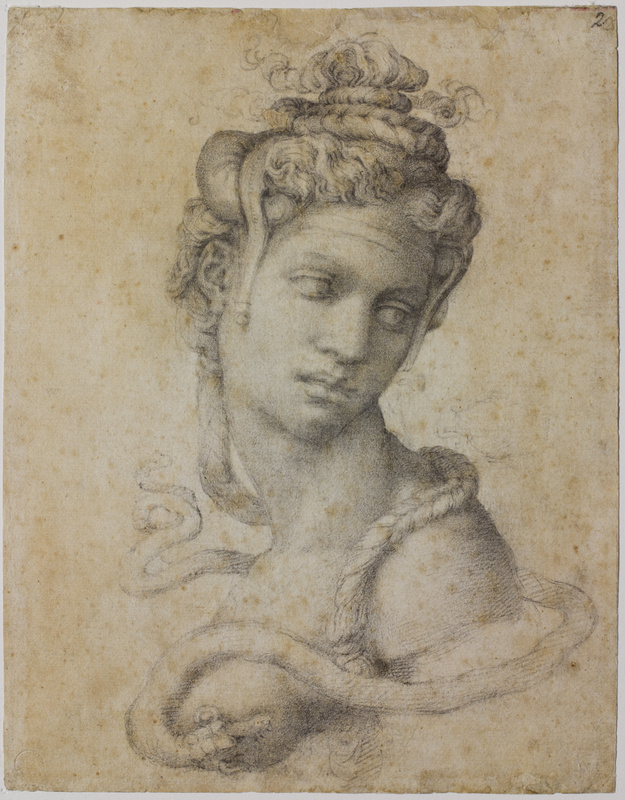 Half a century later in 1614, Duke Cosimo II donated Cleopatra and several other drawings to Michelangelo Buonarroti the Younger for the gallery he was creating in the family home that would become the Casa Buonarotti museum. According to an inventory of Medici artifacts, Cleopatra was hanging in a frame from the 1560s, which means the ugly Cleopatra was out of view at least as soon as it left Cavalieri’s possession. At some point, probably in the 19th century, a backing was glued to the drawing, a common curatorial technique at that time to preserve fragile paper works. You could still faintly see there was another drawing on the back if you lifted it to the light, so when the Uffizi gallery was restoring the piece in August of 1988 in preparation for a major show at Washington’s National Gallery, they decided to remove the backing to reveal what was there. The discovery of the second, much more anguished Cleopatra made international news. Some experts believed it was also done by Michelangelo himself, others that it was clearly not in the master’s hand, others flip-flopped. But what if the ratchet Cleopatra came first and the more accomplished one later? What if in fact the rough, anguished figure is the recto and the finished one the verso? It wouldn’t be the first time Michelangelo turned over a page that had already been drawn on by a student. What if that student in this case were Tommaso de’ Cavalieri himself? Cavalieri tried his hand by drawing the figure on the verso. Not yet a Cleopatra, the head may have been inspired by an antique sculpture that the two friends inspected together, such as the famous Sleeping Ariadne in the Belvedere Court of the Vatican. Or it may have been inspired by Giovanni Boccaccio’s Famous Women: is this Agrippina, the grieving wife of Germanicus, or the Carthaginian Queen Sofonisba just after draining the fateful cup of poison? However, Cavalieri’s halting effort fell short of its classical inspiration (the display of teeth had especially negative connotations). 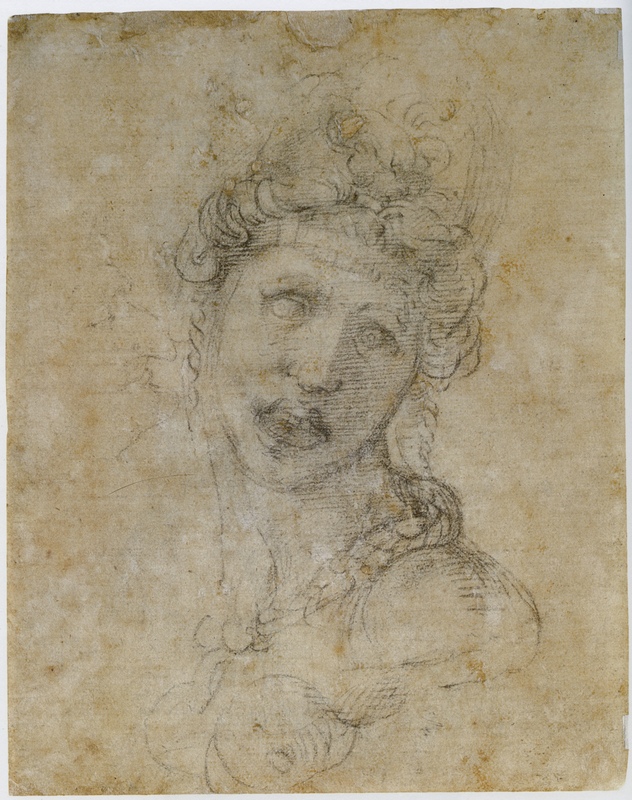 To demonstrate “buon disegno,” Michelangelo reversed the sheet and performed a miracle of artistic alchemy: ugliness became beauty, harrowing but unbecoming emotion became serene resignation, an indecorous head was transformed into a doomed Cleopatra. We are privileged witnesses of Michelangelo turning base matter into gold. I like this theory. To my admittedly inexpert eye, the rough Cleopatra doesn’t look like any of Michelangelo’s figural studies which even at their most dashed off are composed and lovely.